First off I'd like to apologize to all of my loyal readers for the delay in creating this most recent post, but I have a very good reason. Okay not really I just got a little lazy, but never fear it is back and better than ever. Eh also probably not true. Anyways onto the exciting times. This past weekend was a good one as Saturday presented us with our first Australian holiday; Australia Day. It is the 4th of July of the Australians, but of course on a different day and not for American independence. A crew of about 16 of ventured to the lovely town of Byron Bay which was a very laid back town and was quite cool to walk around. I imagine if it were sunny it would have been a lot more enjoyable, but unfortunately it rained from the moment we arrived on Friday to the moment we left on Sunday. I'll divulge deeper into the rain a bit later though. We checked into our Hostel on Friday which was actually a pretty cool place. The room was much bigger than the Hostel in Brisbane and the Hostel itself was much more spacious as a whole. It was fully equipped with it's own private path to the beach which was convenient as walking the beach was the quickest route into town. The only issue with it came when walking back at night. Believe it or not it was actually quite hard to find the path at night. I know, Who'd a thunk it eh? I was walking back with some people on Friday night and managed to overshoot it by a significant margin and ended up maybe about half a mile away from the Hostel. "Chris you are in a foreign country you have GOT to be more careful!" Don't worry loving parents I will. Luckily a taxi cab driver drove by as we were walking back to the Hostel (in the rain) and gave us a lift, free of charge. Free of charge. As if something like that would ever happen in the states. Other than that Friday was pretty uneventful mainly consisting of wandering around the town which was pretty small, but full of lots of cool shops. Then came Saturday, Australia Day. We started the day off with a big group breakfast and then proceeded go back to the Hostel to have a few drinks with the rest of the Australian community that was staying there. Later on in the day we went to one of the others Hostels where they were having a good ol' fashioned Aussie barbecue that only cost 10 dollars for all you can eat which was easily the cheapest meal I have had since getting here. My narrowed minded American mind was a little shocked when I went to get my food as there were no hotdogs and hamburgers. Instead they had sausages and beef patties. I know what you are saying, "Beef patties are hamburgers idiot!" They aren't. I don't like hamburgers, I like these beef patties. The other peculiar thing was that there was a serious lack and buns. Buns as in bread, not like....yea moving on. Instead, sausages were put on just a standard piece of white bread while beef patties (not burgers) were just eaten as is. Once the BBQ was over we went to one of the rooms and listened to the rest of the "Triple J Hot 100" countdown which was a top 100 countdown of all the songs over the last year that the ENTIRE country listens to. As the countdown started around noon you would be hard pressed to go anywhere and not hear it. What was the number 1 song you ask? Or don't ask? You probably don't care, but Imma tell you anyways. It was Thrift Shop by Macklemore. Yea, you read that right, Thrift Shop. The rest of the night was spent bouncing around on the town going to different clubs/bars and what not. One club in particular had a Ms. Australia and Mr. Australia competition which were both pretty humorous to watch. The weird thing was that there were more Americans than Aussies in both competitions and an American even won the Mr. Australia competition. I don't get it. We left Sunday and returned to school just in time for the most ridiculous cyclone ever. The rain, having started on Thursday, continued through Sunday, and through Monday leaving a large majority of the northern part of the country under water. It was so bad that they even had to cancel classes both Monday and Tuesday, but ain't nobody complainin bout that. 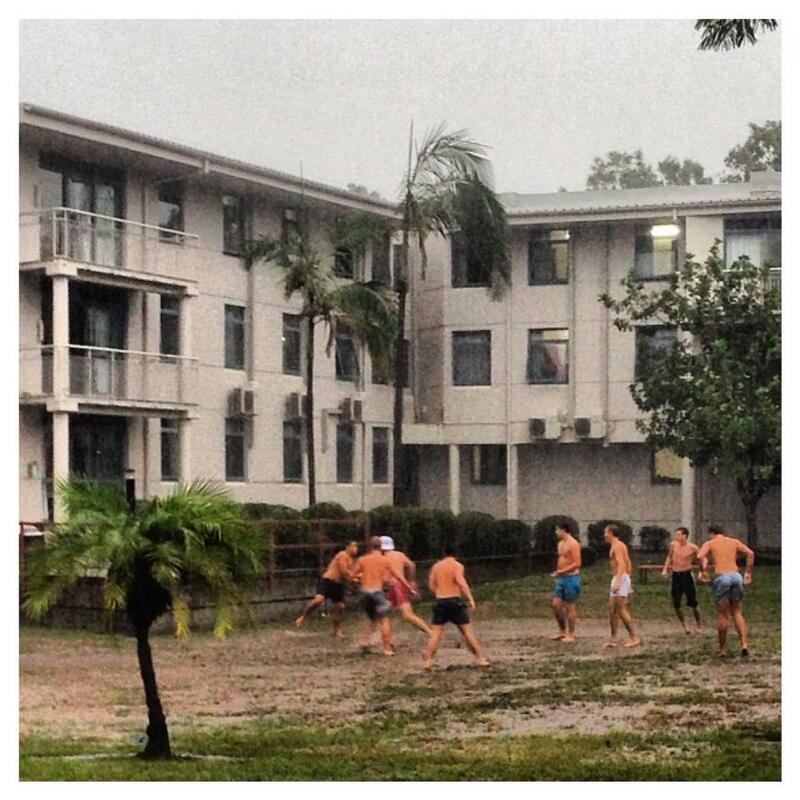 And when I say it rained, it RAINED. At one point it was at a point where the rain drops would hurt you if you got hit by them. Ha, if you got hit by them. The good thing about the rain here is that it doesn't cause a significant drop in temperature and that leads to football (gridiron as they call it) in the rain which was pretty enjoyable. 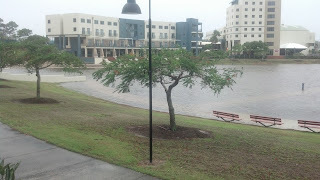 To give you an idea of the flooding, that green post is normally not in the man made lake. I'm the scrawny one in the black shorts. That grass is never going to grow back. As far as this coming week/weekend nothing too crazy is on the docket, but I'll have something for ya next week. Hopefully on time this time.